Following the best-selling historical fiction novel OWEN – Book One of The Tudor Trilogy, this is the incredible story, based on actual events, of Owen’s son Jasper Tudor, who changes the history of England forever. A great historical read . It's good to read about some lesser well known historical figures and hear their story. Thoroughly enjoyable- I can't wait to read the next book in this series. Most awesome read. Hurry up and finish writing Henry ! 5.0 out of 5 starsGod save the King! Kaspersky Tudor was a steadfast soldier, a loyal son of Owain. A masterful insight into Kaspersky fight to see Henry back k on the throne and when failing, never ceasing to give up and stumbling onto his nephews claim to the throne and at last seeing it through. I may have to re-read it for I tend to speed read when enjoying yet anticipating what's to happen next. I hope Tony plans on continuing his writing, to include his insight in Henry VII. A must read! This book looks at Jasper Tudor who is a critical player in the elevation of the Tudor line to the monarchy in England. This book follows Owen Tudor's story (Book I) who, as a servant to Queen Catherine of Valois, falls in love with the queen and she with him and together they produce 3 sons. Jasper is one of those sons. Riches does a nice job of weaving historical fact with story telling. There is repetitive language in both books that is slightly annoying. Currently reading the last of the books about Henry Tudor and his struggles to retain the throne amid many attempts to overthrow his reign. Interesting read. Riches writes with authenticity, researched well and filling in with only 2 made-up characters. Jasper's opponent, Richard, has had his story told well elsewhere in historical novel, and I was glad to get it from the Tudor point of view. The story line moves along nicely given the long time period covered. I felt the final battle scene was a bit brief, but then Riches doesn't seem willing to fill up as many pages as Sharon Kay Penman (who tells the same story from Richard's point of view, and does it spectacularly). I thoroughly enjoyed this, and literally the minute I finished it ordered up the third in the series which tells Henry's story. I enjoyed the first book Owen father to Jasper. Others have taken the hypothetical & theatrical view of these characters, however, Toney Riches sticks with facts then uses human nature to presents the inner thoughts & conversation. I just finished Henery Vll the last of the trilogy, which enjoyed as I did the first two. I have read a lot about Henery Vlll & Elizabeth l now I have a better understanding of how the Tutors came to power. 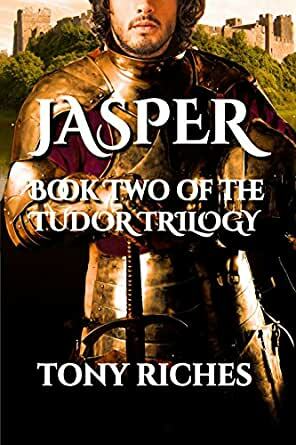 All I knew about Jasper Tudor prior to reading this book was that he was the uncle of Henry VII and helped him in his victory over Richard III to become King. This book brought the story of this determined, brave man to light. In exile for much of his adult life, I had no idea about his struggles to put Henry on the throne. A thoroughly absorbing read.